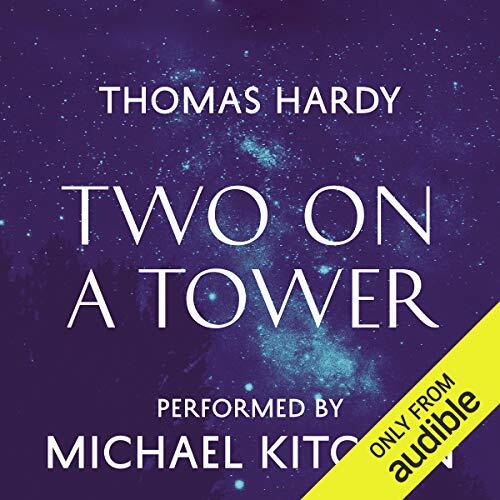 Two on a Tower is Hardy's ninth novel and contains perhaps his most complete use of the theme of love across the class and age divide, to beautifully depict Hardy's reverence for science and astronomy. The unhappily married Lady Constantine breaks all the rules of social etiquette when she falls in love with young Swithin St. Cleeve, an astronomer and her social inferior. Despite their differences that society deems unacceptable, together, from an astronomical observatory, the lovers 'sweep the heavens'. But work, ambition and the pressures of the outside world intrude upon the pair. Swithin is faced with a cruel choice. The death of Lady Constantine's husband leaves them free to marry but it's not that simple. He has the option of furthering his education with an inheritance that will propel his career into the highest levels of astronomical science. Does he choose love or ambition? Within Two on a Tower, Hardy creates a wonderful and timeless contrast between the infinite reaches of the universe and the infinitesimal scale of human affairs. Hardy's intention, in his own words, was to 'set the emotional history of two infinitesimal lives against the stupendous background of the stellar universe'. Hardy was a Victorian realist whose novels and poetry were greatly influenced by Romanticism, especially the poet William Wordsworth. His critical thoughts on Victorian society can be seen throughout much of his work. Michael Kitchen is an accomplished actor of stage and screen. He is best known for his role as Detective Chief Superintendent Christopher Foyle in the ITV drama series Foyle's War (2002-2015). He has also starred as Bill Tanner in the Bond films GoldenEye (1995) and The World Is Not Enough (1999) as well as Berkeley Cole in the film Out of Africa (1985). Other notable television appearances have included roles in BBC Four's critically acclaimed comedy series Brian Pern (2017) and Channel 4's comedy Hacks (2012). Michael Kitchen's stage performances have included Mercutio in Romeo and Juliet for the Royal Shakespeare Company and roles in Tom Stoppard's plays On the Razzle and Rough Crossing. He has narrated many classic and contemporary audiobooks including Thomas Hardy's Two on a Tower, Emily Bronte's Wuthering Heights and Robert Lewis Stevenson's The Strange Case of Dr Jekyll and Mr Hyde. Thomas Hardy writes melodrama like nobody else ever and that's a good thing .I have never "read" any Hardy until this year but I am becoming a big fan .This is the second of his books I've heard this year and have a third in my library ready to listen to . His wording while at times lenghty is beautiful .He sets excellent moods and you can see the story play out in your mind.Michael Kitchen perfectly captures the mood and emotions of every character . I hope there's a BBC miniseries filmed for this one day . If you could sum up Two on a Tower in three words, what would they be? What was one of the most memorable moments of Two on a Tower? Which character – as performed by Michael Kitchen – was your favorite? This is generally regarded as a minor work of Hardy's. If that's true then it's still better than most famous authors' masterpieces. I fell in love with the heroine and the setting and Hardy had a lot to say from which he did not shy away. It wasn't a perfect book. The hero Swithin, never quite materialized for me and I'm not sure how much I felt the romance. I loved her but not really 'them'. There were a few slow spots too and the very last sentence of the book was for me a huge disappointment and a mistake on Hardy's part in my humble opinion. This book has many of Thomas Hardy's usual themes--literally star-crossed lovers--but it is more condensed than his longer novels. Aside from a rushed, unsatisfying ending, I really enjoyed it. And Michael Kitchen is an amazing reader. Michael Kitchen did a magnificent job of narrating Thomas Hardy's heart breaking love story. For any guy, or non-perfumed and non-powered male who happens to read my first sentence, I hasten to add, this is a guy's book, a real man's book. It is about astronomy and gadgets and stuff. Old Tom knew a great deal about the science. OK they fall in love looking at the stars, this older unhappily married woman and the young single man with a single minded devotion to astronomy. They got married in secret because of the difference in their status which changes occasionally. Then, it turns out their marriage wasn't quite valid due to some odd or another husband being still alive at the time. Thomas Harding wrote a delicious book which if you do not like says a great deal more about yourself than about Thomas Harding. Finally, I want to say something about Micheal Kitchen. He made this book live! I have read this book many times but Mr. Kitchen made me understand things I have overlooked before. There are things which can only be brought out by the human voice. Perhaps a story can only be truly told around a campfire 30,000 years ago. Mr. Kitchen and Mr. Harding were at that campfire. I was there also and I am very thankful to them both. Michael Kitchen's reading makes it worthwhile to stay until the end, but what a strangely feminine, domestic story from Thomas Hardy. Such minute attention to turns of mind and feeling, coupled with convenient chance occurrences to frustrate our hapless heroine. some of his phrases are so stunningly beautiful...you just think: how did he think of saying it like that? and a very good story too. Who would have thought Hardy could write a funny farce like this. Of course being Hardy it is pretty bitter sweet. Plenty of good language delightfully rendered by Foyle himself. I know all of Hardy's great novels well. This is the first of his "lesser" novels that I've listened to. Frankly, it was rather dull-definitely lesser. Neither the characters nor the plot are particularly interesting, and some elements in the story are rather preposterous. It's not in the same league as books like The Woodlanders or Tess. If you are a Hardy fan, you will like this book. The end surprised me. The narrator is expressive and his pacing good. Love how natulre was a part of the story, almost a character. Could not finish listening to the book. What could Thomas Hardy have done to make this a more enjoyable book for you? Thomas hardy is one of my favorite writers. His novels need to be read aloud. In this case I couldn't listen to this reader. What didn’t you like about Michael Kitchen’s performance? Mr. Kitchen over enunciated the the words in such a clipped manner I couldn't finish listening to the book. He had no feeling for Thomas Hardy's prose. what a disappointment! Please get a more appropriate reader for this novel. This was a mildly enjoyable listen, interesting for the astronomical aspects of the plot and the local dialogue. The plot was somewhat contrived and the prose in general not up to the brilliance of Hardy's better work such as "The Mayor of Casterbridge". Michael Kitchen did a solid job of narration. What made the experience of listening to Two on a Tower the most enjoyable? The would they, won't they element. What other book might you compare Two on a Tower to, and why? What does Michael Kitchen bring to the story that you wouldn’t experience if you had only read the book? Michael is a great narrator, brings the story to life. An engrossing story that draws you in although the main characters are thinly drawn. By chapter 32 I was beginning to lose sympathy with the main character and felt there would never be a resolution. However patience paid off and the ending was fitting. Much is left India and left to the imagination. It is perhaps not one of Hardy's best works but it nonetheless impressive and far superior to much modern fiction.